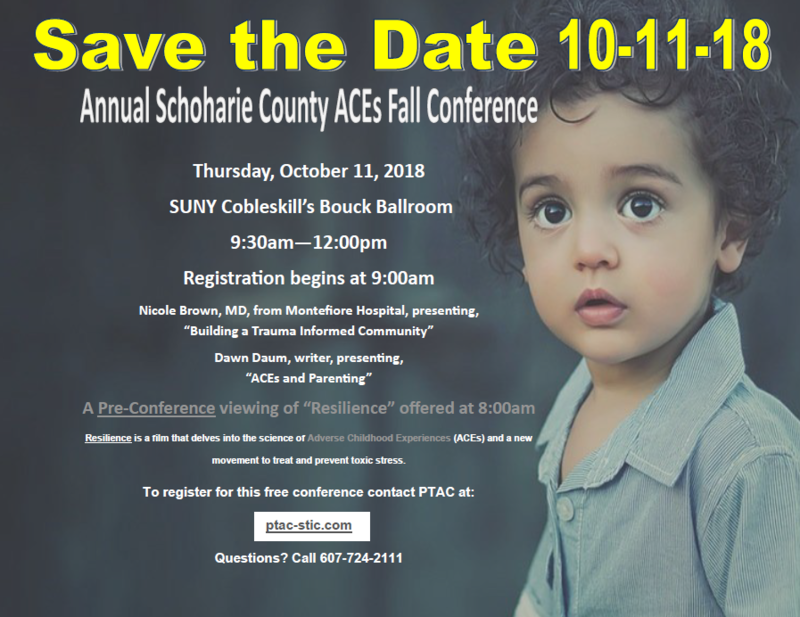 On October 11, 2018 the Schoharie County ACEs Team is sponsoring a free conference featuring Nicole Brown, MD, from Montefiore Hospital and Dawn Daum, writer. This conference is being held from 9:30am- 12:00pm with morning registration beginning at 9:00am. The conference is being held at SUNY Cobleskill's Bouck Ballroom located at 106 Suffolk Cir, Cobleskill, NY 12043. Dr. Brown will be presenting, "Building a Trauma Informed Community" where she will discuss ways to create community wide adverse childhood experiences awareness and response to the effects ACEs. Dawn Daum will be presenting, ?ACEs and Parenting?, where she will discuss the struggles of parenting when you, the parent, have a history of ACEs. A pre-conference viewing of Resilience, will be shown at 8:00am, for those interested Resilience is a film that delves into the science of Adverse Childhood Experiences (ACEs) and a new movement to treat and prevent toxic stress. Return to a complete listing of all RHENSOM news and events.